Add a beautiful, avian landmark to your landscaping with the Heartwood The Barrington Bird House. 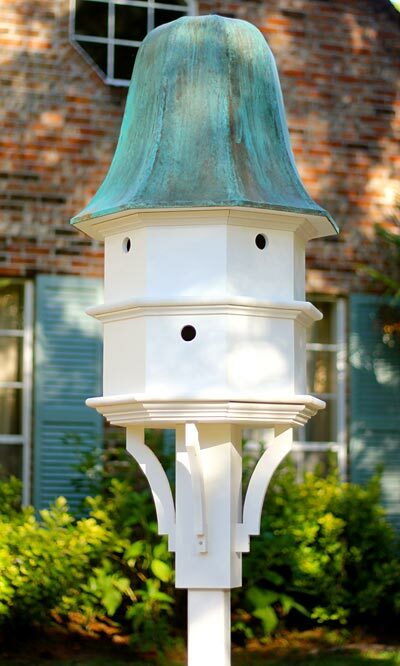 The graceful, curved roof, white and verdigris tones, and octagonal shape create a distinctive structure, certain to impress any visitor to your bird garden. Dual levels bring not only height, but also plenty of roosting spots, to this item, while the all white body adds a crisp look to your yard. Eight 1.5" diameter entry holes lead to individual avian apartments, for several songbird families to roost at once. The alternating placement of these doorways helps define each of the eight panels, further highlighting the fantastic shapes in your garden. A stepped ledge beneath each level not only visually divides the piece; it also offers landing and resting spots for your feathered friends. A significant, aged copper roof completes this item, flaring out toward the base to protect the openings from the elements. Its curved top and verdigris color further the classic look of the unit, while each facet aligns with those on the home's body for a cohesive and wonderful effect. Made of cellular PVC, this dramatic abode mimics the look of wood, while requiring little maintenance to remain lovely. The exterior of the home remains impervious to high humidity, wood-boring insects, and freezing and thawing, and will not split, crack, or warp for a lasting structure. Its mounting sleeve slides over a standard 4 x 4 post (not included) for a sturdy display, and arched brackets on this sleeve bring more curves to the piece. Offer several bird families a remarkable home with The Barrington Bird House. Assembly required. Made in the USA.